In Dutch we use the term Borrelboot: a relaxing cruise for cocktails with good friends. 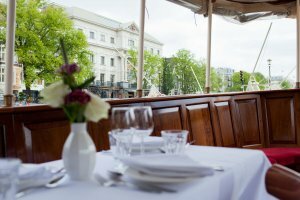 Whether its a glass of wine and hors doeuvres before a theatre or dinner event or just a few glasses to end the evening, our Amsterdam Cocktail Cruise package is sure to delight. You have probably been waiting for this evening for quite some time: your dearest friends all together at last for a play or concert.Youre anticipating a wonderful evening, but why not make it even more special? 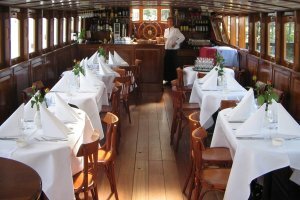 Start the celebration a bit earlier on a Rederij Belle Borrelboot, sailing through the canals of Amsterdam to arrive – right on time – at your special event. Beer, wine or champagne? Croquettes or amuse-bouche? We can make your hours aboard as simple or sophisticated as you wish. Do you have reservations to dine with friends or family at one of Amsterdams restaurants? In that case, a Borrelboot cocktail cruise is a great pre-dinner event. 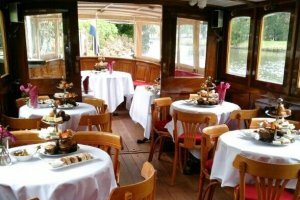 You will sail to your reserved table in style and can enjoy some appetisers along the way. On board, you might even make your choice from the menu! Imagine a group of your favourite people, stepping aboard a private boat to sail around Amsterdam while enjoying drinks together. You might even want to keep your special cocktail cruise a secret, only telling your guests where they should be and when. Whatever you choose, your party will sail from the location of your choice for two hours to your theatre, concert hall or restaurant. 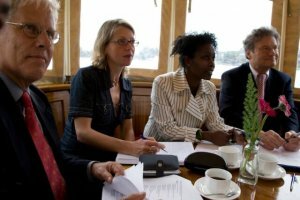 Most importantly, you will have plenty of time to enjoy each others company and the Netherlands beautiful capital city. Thanks to the many waterways in Amsterdam, we can usually come very near to your final destination, usually within walking distance. If not, we are happy to arrange road transport to your next stop. 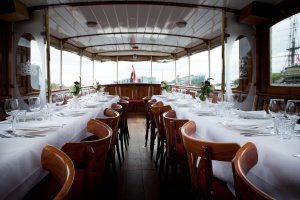 You can enjoy your private Cocktail Cruise not only in Amsterdam but also on the Vecht and Amstel Rivers and the Loosdrecht Lakes. This bubbling package includes a two-hour cruise with appetisers and unlimited drinks. The price per person begins at € 42.50. We would love to hear where and how you would like to sail and sip cocktails!